In this post I want to talk about a recent performance gain for JAX-WS web service requests I made in Apache CXF. It was prompted by a mail to the CXF users list. The scenario was for a JAX-WS web service where certain requests are secured using WS-SecurityPolicy, and other requests are not. The problem was that the user observed that the security interceptors were always invoked in CXF, even for the requests that had no security applied to the message, and that this resulted in a noticeable performance penalty for large requests. The reason for the performance penalty is that CXF needs to convert the request into a Document Object Model to apply WS-Security (note there is also a streaming WS-Security implementation available, but the performance is roughly similar). CXF needs to perform this conversion as it requires access to the full Document to perform XML Signature verification, etc. on the request. So even for the insecure request, it would apply CXF's SAAJInInterceptor. Then it would iterate through the security headers of the request, find that there was none present, and skip security processing. However when thinking about this problem, I realised that before invoking the SAAJInInterceptor, we could check to see whether a security header is actually present in the request (and whether it matches the configured "actor" if one is configured). CXF makes the message headers available in DOM form, but not the SOAP Body (unless SAAJInInterceptor is called). If no matching security header is available, then we can skip security processing, and instead just perform WS-SecurityPolicy assertion using a set of empty results. This idea is implemented in CXF for the 3.3.2 release via the task CXF-8010. To test what happens, I added a test-case to github here. This creates a war file with a service with two operations, one that is not secured, and one that has a WS-SecurityPolicy asymmetric binding applied to the operations. Both operations contain two parameters, an integer and a String description. To test it, I added a JMeter test-case here. It uses 10 threads to call the insecure operation 30,000 times. The description String in each request contains the URL encoded version of the WS-Security specification to test what happens with a somewhat large request. Using CXF 3.3.1 the throughput is 1604.25 requests per second, whereas with CXF 3.3.2 the throughput is 1795.26 requests per second, a gain of roughly 9%. For a more complex SOAP Body I would expect the gain to be a lot greater. Apache CXF provides support for the HTTP Signatures draft spec since the 3.3.0 release. Up to this point, JAX-RS message payloads could be signed using either XML Security or else using JOSE. In particular, the JOSE functionality can be used to also sign HTTP headers. However it doesn't allow the possibility to sign the HTTP method and Path, something that HTTP Signature supports. In this post we'll look at how to use HTTP Signatures with Apache CXF. cxf-jaxrs-httpsig: This project contains a test that shows how to use the HTTP Signature functionality in Apache CXF to sign a message to/from a JAX-RS service. Here we can see that a keystore is being used to retrieve the private key for signing the outbound request. If you wish to retrieve keys from some other source, then instead of using configuration properties it's best to configure the MessageSigner class directly on the CreateSignatureClientFilter. The service configuration is defined in spring. Two different JAX-RS providers are used on the service side - VerifySignatureFilter is used to verify a signature on the client request, and CreateSignatureFilter is used to sign the response message. For more information on how to use HTTP Signatures with Apache CXF, refer to the CXF documentation. JSON Web Tokens (JWT) have been covered extensively on this blog (for example here). In this post we will cover how JWT tokens can be used for authorization when sent to a JAX-RS web service in Apache CXF. In particular, we will show how Apache CXF 3.3.0 supports claims based access control with JWT tokens. JWT tokens can be used for the purpose of authentication in a web service context, by verifying the signature on the token and taking the "sub" claim as the authenticated principal. This assumes no proof of possession of the token, something we will revisit in a future blog post. Once this is done we have the option of performing an authorization check on the authenticated principal. This can be done easily via RBAC by using a claim in the token to represent a role. Here the JwtAuthenticationFilter has been configured with a "roleClaim" property of "role". It then extracts the configured claim from the authenticated token and uses it for the RBAC authorization decision. To see this functionality in action, look at the corresponding test-case in my github repo. We can specify multiple claims annotations and combine them in different ways, please see the CXF webpage for more information. To see this functionality in action, look at the corresponding test-case in my github repo. In the previous blog post, we showed how to use Apache Camel to query an Apache Kafka broker, which is secured using kerberos. In this post, we will build on the previous blog post by showing how to deploy our Camel route to Apache Karaf. Karaf is an application runtime container that makes it incredibly easy to deploy simple applications via its "hot deploy" feature. As always, there are a few slightly tricky considerations when using kerberos, which is the purpose of this post. As a pre-requisite to this article, please follow the previous blog post to set up Apache Kafka using kerberos, and test that the Camel route can retrieve from the topic we created successfully. Now start Karaf via "bin/karaf". Karaf uses JAAS for authentication (see the documentation here). In the console, enter "jaas:" and hit 'tab' to see the possibilities. For example, "jaas:realm-list" displays the JAAS realms that are currently configured. Recall that our Camel route needs to configure a JAAS LoginModule for Kerberos. In the example given in the previous post, this was configured by setting the Java System property "java.security.auth.login.config" to point to the JAAS configuration file. We don't want to do that with Karaf, as otherwise we will end up overriding the other JAAS LoginModules that are installed. Then we need to install a few dependencies in Karaf. Add the Camel repo via "repo-add camel 2.23.1", and install the relevant Camel dependencies via: "feature:install camel camel-kafka". Our Camel route should then automatically start, and will retrieve the messages from the Kafka topic and write them to the filesystem, as configured in the route. The message payload and headers are logged in "data/log/karaf.log". Apache Camel is a well-known integration framework available at the Apache Software Foundation. It comes with a huge number of components to integrate with pretty much anything you can think of. Naturally, it has a dedicated component to communicate with the popular Apache Kafka project. In this blog entry, we'll show first how to use Apache Camel as a consumer for a Kafka topic. Then we will show how to configure things when we are securing the Kafka broker with kerberos, something that often causes problems. Type a few messages into the producer console to make sure that it is working. Simply run "mvn clean install" and observe the logs indicating that Camel has retrieved the messages you put into the topic with the producer above. Then check "target/results" to see the files containing the message bodies. So far so good. Now let's look at securing the Kafka broker using kerberos. 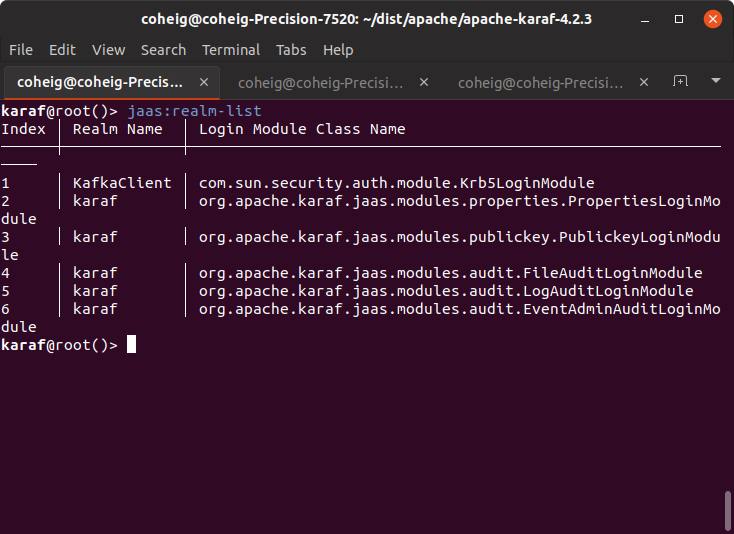 I wrote a previous blog post to show how to use Apache Kerby as a KDC with Kafka, so please follow the steps outlined here, skipping the parts about configuring the consumer. Camel uses "GSSAPI" as the default SASL mechanism, and so we don't have to configure that. Now re-run "mvn clean install" and you will see the Camel route get a ticket from the Kerby KDC and consuming messages successfully from the Kafka topic. We've covered on this blog before how to configure an Apache CXF service to validate kerberos tokens. However, what if we have a use-case where we want to have multiple endpoints validate kerberos tokens that are in different realms? As Java uses system properties to configure kerberos, things can get a bit tricky if we want to co-locate the services in the same JVM. In this article we'll show how it's done. The scenario is that we have two KDCs. The first KDC has realm "realma.apache.org", with users "alice" and "bob/service.realma.apache.org". The second KDC has realm "realmb.apache.org", with users "carol" and "dave/service.realmb.apache.org". We have a single service with two different endpoints - one which will authenticate users in "realma.apache.org", and the second that will authenticate users in "realmb.apache.org". Both endpoints have keytabs that we have exported from the KDC for "bob" and "dave". Here we configure how to reach both KDCs for our different realms. We have a JAX-WS endpoint with a "ws-security.bst.validator" property which points to a KerberosTokenValidator instance. This tells CXF to process a received BinarySecurityToken with the KerberosTokenValidator. The KerberosTokenValidator is configured with a CallbackHandler implementation, to supply a username and password (see here for a sample implementation). Note that this is not required normally when we have a keytab file, but it appears to be required when we do not define a default realm. 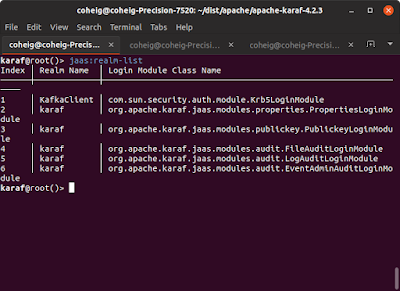 The KerberosTokenValidator instance also defines the JAAS context name, as well as the fully qualified principal name. As this is in service name form, we have to set the property "usernameServiceNameForm" to "true" as well. If we set up the endpoint for "bob" with similar configuration, then our krb5.conf doesn't need the "default_realm" property and we can successfully validate tickets for both realms.